Signing and Photo opportunity w/ Dallas Cowboys Players: Dwayne Harris, Lance Dunbar, Ronald Leary, George Selvie, Phillip Tanner and Bruce Carter. *Family members must be accompanied by a district employee with employee ID badge. 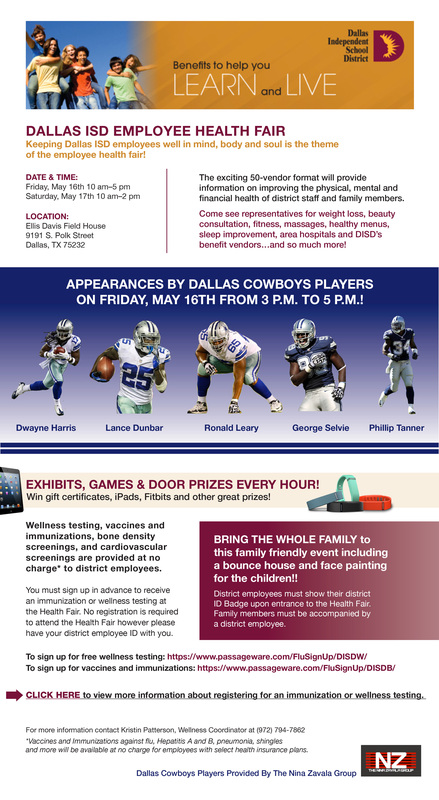 This entry was posted in Events, Uncategorized and tagged ABC SPORTS, Autograph Signing, Bruce Carter, CBS Sports, Contest, Dallas Cowboys, Dallas ISD, Dallas ISD Employee Health Fair, Dallas Texas, Dexter McReal, Dwayne Harris, ESPN, ESPN Dallas, Football, FOX Sports, George Selvie, Golds Gym, Health and Fitness, iPads, Keith Dixon, Kristin Patterson, Lance Dunbar, NBC Sports, NFL, Nina Zavala, Nina Zavala Group, Phillip Tanner, SI, USA Today Sports, Vendors, YAHOO SPORTS by Nina Zavala Group. Bookmark the permalink.